We’re as passionate about firearms as the many hunting and shooting enthusiasts we serve and support. 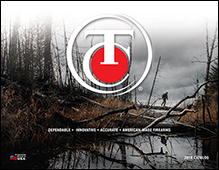 Since 1967, Thompson/Center Arms™ has been synonymous with firearms that stand up in the toughest situations and perform when it counts. With features like interchangeable barrels, 5R rifling, uncompromised quality, and innovative design, Thompson/Center™ is the brand that delivers value and reliability you won’t find anywhere else. That’s why today’s top hunters rely on T/C®. We’re proud to offer American-made firearms and back them up with knowledgeable support and a Lifetime Warranty. We know that missed moments can’t be refunded, there is no replacement value for the trophy that got away. There are only so many shots of a lifetime out there and we’re ready to help you with each one. Order your free full-color print version by mail by filling out the form below. I would also like to receive Thompson/Center’s eNewsletter.